You may already have an iPod/iPhone speaker system for your home or office and enjoy the sound quality. You learned a good deal researching your last purchase and now realize that you want another audio system for your bedroom, office, or other music missing location. You want a higher end audio system that won’t break the bank – something that sounds great and looks great too. 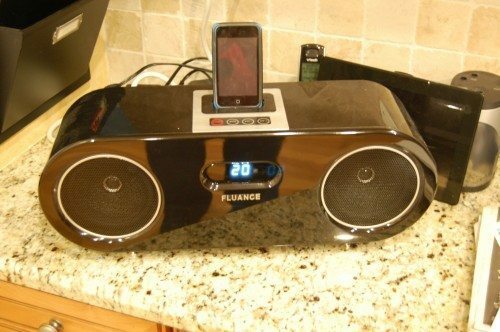 Fluance, the maker of high quality and high performance audio equipment at a reasonable price has introduced the Fluance FiSDK500 Music System for iPod/iPhone , and at $199 the company is saying that it has set a new price and performance standard in the speaker dock market. You will just have to read on to see if the speaker dock lives up to the company’s marketing. The shipment for the Fluance FiSDK500 arrived at my home and I was surprised at the heft of the package – weighing in at over 15 pounds – this was not your ordinary speaker dock. I opened the package and found a very well packaged speaker dock. The product was encased in form fitting foam and wrapped in a protective cling plastic to protect the gloss piano black finish on the speaker dock. When I removed the plastic cling wrap I was impressed with the paint job – it is reminiscent of the gloss piano black finish on a baby grand piano. Beautiful, deep shine and product workmanship oozed from the Fluance FiSDK500. My first thought when pulling the FiSDK500 out of the box was “This thing is heavy.” And at 15 pounds it is heavy for the size of the unit. The weight comes from the speakers, amp, and materials used to construct the FiSDK500. Making a product with significant weight conveys to me that this is a quality product made by someone that picked a great set of components, but that it is not always true, as some companies add filler weight to convey this idea. Think about the handsets for your wireless telephone for a moment, they have added weight over and above the electronics and battery in the handsets to give them heft so they feel right in your hand, yet the extra weight is not required for the function of the device. One of the things that has always challenged me is the name the company bestows on its pride and job products and the FiSDK500 is yet another example of the great world of product naming. 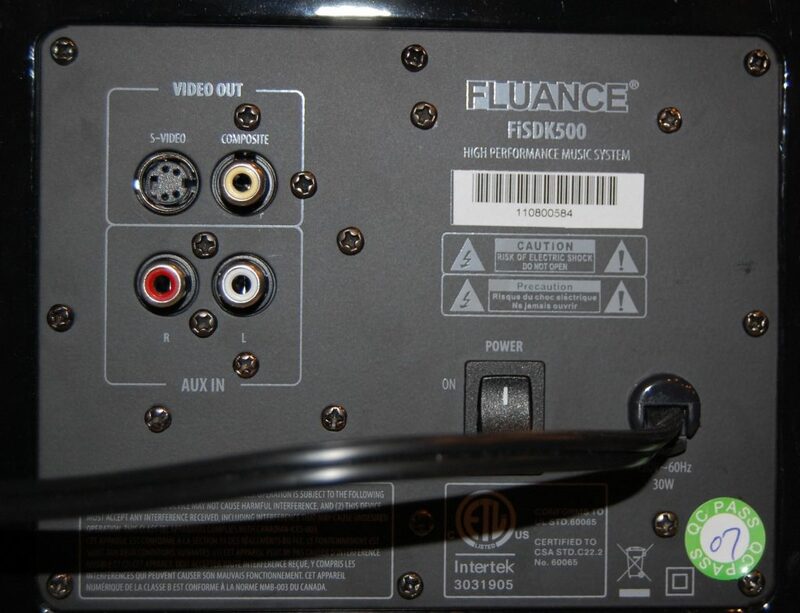 I tried to decode the FiSDK500 product name on my own and came up with “Fluance iPod/iPhone Speaker Dock 500.” To be brutually honest, these kinds of names drive me up the wall as they convey nothing of the emotional connection to a product that I would like to see in the market for speaker docks, or any other product for that matter. I looked up a variety of names for speaker docks and found some great ones that conveyed an emotional connection, including “Zepplin Air, Mix BoomBox, InMotion (portable), Octiv, and SoundDock.” I would strongly suggest to those company’s building these products to create a name that conveys a strong emotional connection to their consumer audiene and what the product does. 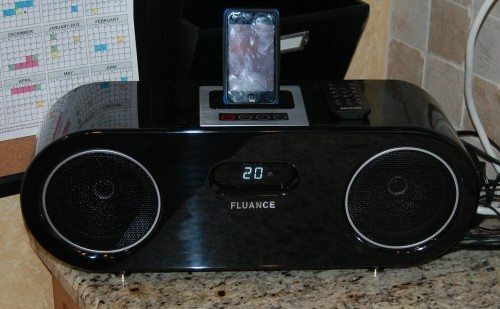 This product could have been named the “Fluance iPod/iPhone BabyGrand Speaker Dock” and I would have loved the name as it conveyed the type of musical connection to the actual audiophile grade product and the gloss black lacquered finish. 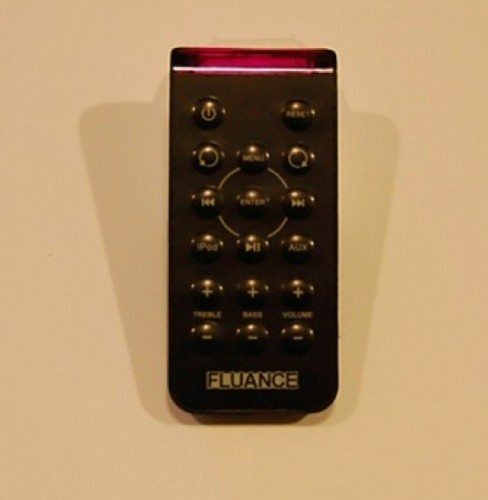 If the Fluance team is reading this I will happily take a fee for the naming of your future products – I know, don’t worry the check is in the mail. In all seriousness, one of the reasons that we are happy to review these products is to help build better products for the market and the consumer and it is done with great pride and pleasure. Setting up the FiSDK500 required nothing more than connecting the feet and plugging it in. Included in the package are six iPhone/iPod dock adapters, and they pop in just like any other speaker dock supporting any one of a number of iPod and iPhones with dock connectors. Now, you are probably asking what are the “feet” that I referred to in the last sentence? Many high end speakers include noise isolating feet that stabilize the speaker system to avoid any distortion or vibration that may interfere with the audio quality and the FiSDK500 has brought that concept to the iPod/iPhone speaker dock market. The feet are well made and heavy and include discs that support the points of the feet. The instructions are very clearly laid out, and after reading them I realized that the FiSDK500 requires a 10 hour break in period to flex the woven speakers to achieve the best sound quality. I followed the instructions and found that the audio quality improved over the 10 hours. To be honest, this is a new concept to me – the idea of breaking in a set of speakers, but it makes sense. I break in a new set of sneakers, or a new car to ensure that I get the best performance out of the it, and after performing the break in on the FiSDK500 I can appreciate why. The sound became richer and fuller as the speakers adjusted. Input – changes the inputs from iPod/iPhone to Auxillary input. What about the sound? The sound is, in a word, incredible for the price. The bass is deep and the treble is clean. I tried the FiSDK500 with a variety of music genres including Jazz, Rock, and Classical. I also used the FiSDK500 as a TV Speaker for a movie that I setup for my children outside with a projector and the sound filled our driveway. The only issue that I could find with the audio quality was at higher volumes over 30 on the Volume Indicator where the audio started to degrade. The only reason that I could find by reading through the specifications is that the amp is a 20 watt amp. Many of the higher end units on the market include a bit larger amp to power the speaker docks at higher volumes. I also used the FiSDK500 to connect my digital photo frame with Pandora and found the sound very rich and full. The RCA connectors are a welcome addition that make the speaker dock a flexible solution in comparison to many speaker docks on the market that are dedicated to an iPod/iPhone and may or may not have a dedicated auxiliary connection. Many auxiliary connections are mini stereo connections. Many consumers of speaker docks like to have an AM/FM tuner included in their speaker dock, or a clock with alarm functionality, but that is simply not the purpose or the idea behind the FiSDK500 – it is purely an audiophile grade speaker dock, nothing more, nothing less. When I turned on the FiSDK500 it made a noise that indicated the amp had powered up. This is a feature of many high-end audio systems. There is a power switch on the back of the unit. I did not test how much power the FiSDK500 drew while in operation, but I did notice that my iPhone/iPod did not charge when the FiSDK500 was in standby. I was surprised at this as there is no way to charge the iPhone/iPod unless one leaves the FiSDK500 powered up or one removed the iPod/iPhone to charge it in a dock or with the power cable. This one change in the firmware of the unit would be a welcome change. I would highly recommend that anyone looking for a professional level audiophile quality iPhone/iPod speaker dock take the time to review the Fluance FiSDK500 with its great sound and beautiful glossy black case. Sound quality at high volume levels. Does not charge your iPod/iPhone when in Standby mode. Name of the product, FiSDK500, is hard to remember. Fluance FiSDK500 Music System for iPod/iPhone Product Review originally appeared on The Gadgeteer on November 12, 2011 at 10:00 am.